Mobile responsive One Page Checkout with Facebook/Google+, MailChimp and Ship2Pay feature. It can be used with any theme & any payment method. Compatibility with 30+ Payment & Shipping Methods. This One Page Checkout Module is GDPR compliant. 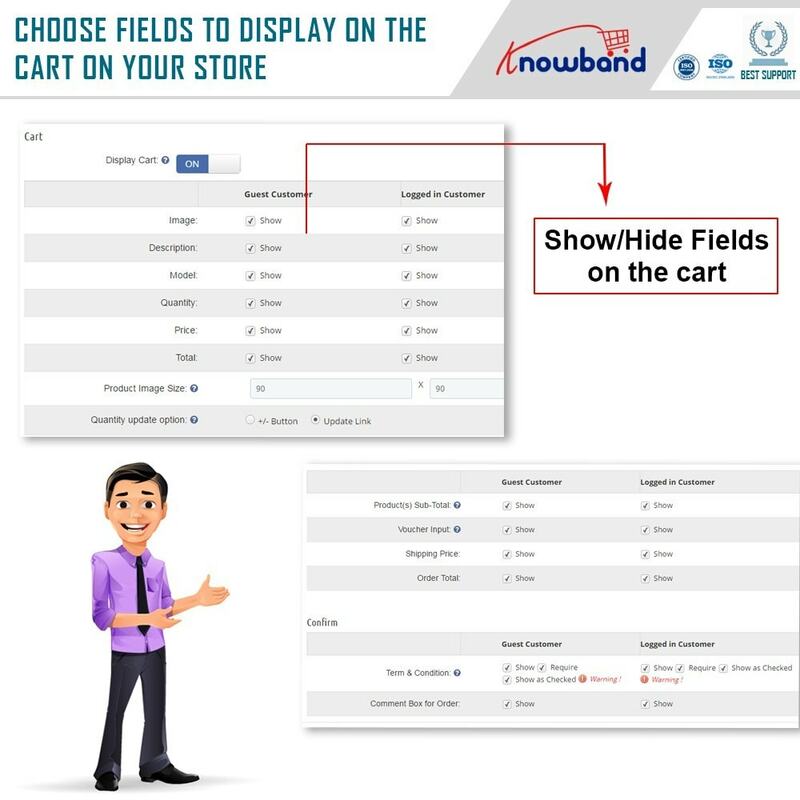 Show/Hide any Fields: The store admin can decide which fields he/she want to display on the checkout page with the help of fast one-page checkout module. This quick checkout module has the functionality to show/hide fields like Company, VAT, Address title etc. Customize buttons: You can change your page buttons color to match them with your theme template by using color picker tool of responsive checkout module admin panel. No coding knowledge is required. You can do it in just a few clicks. Customer Consent: The quick checkout module Prestashop provides the e-merchants to record the customer consent along with the order reference id, email id, customer name, type of accepted consent, date as well as time too. The admin can check the desired customer consent just by entering the order reference id or email id. Mailchimp: The Prestashop store admin can send customer email id directly to Mailchimp either when customer come out from email field or when he places an order after selecting the checkbox for newsletter subscription. 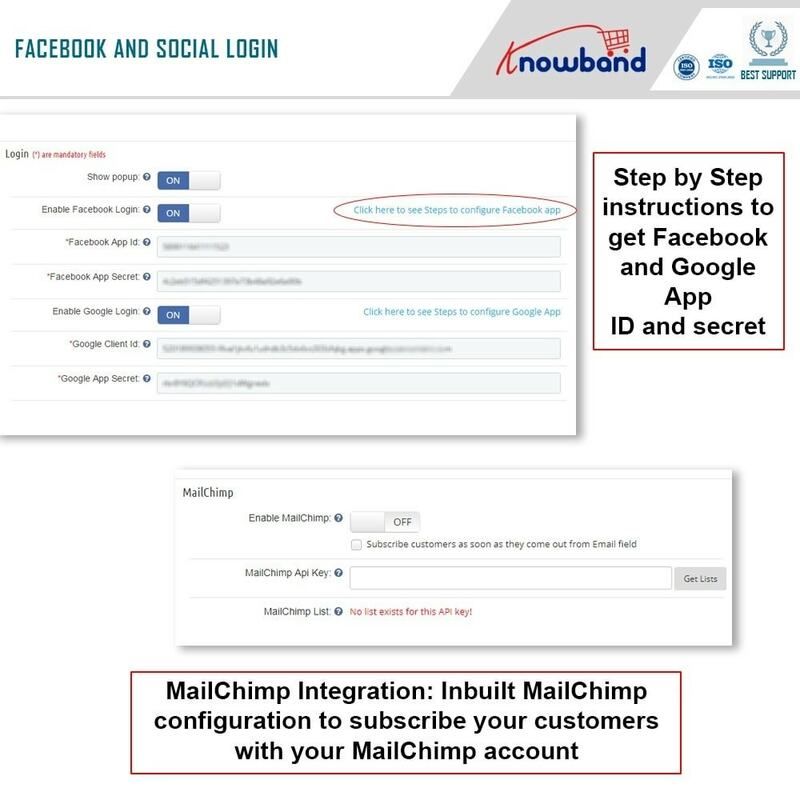 If any customer logins via social login options(Google or Facebook button), even then the email will be sent to Mailchimp. 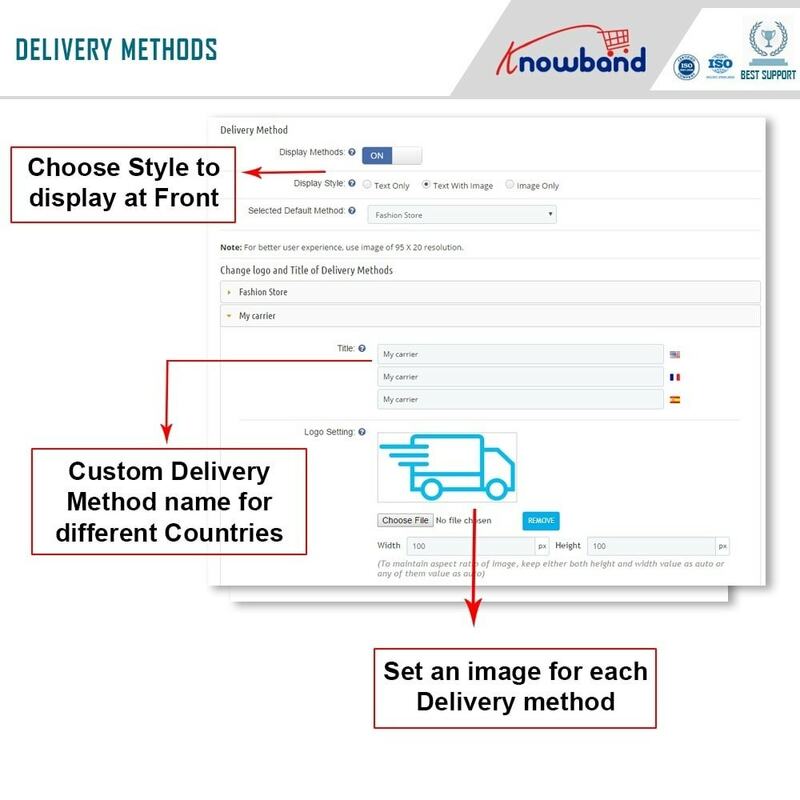 Change Shipping/Payment method name or image: This one-step checkout module allows the store admin to change the shipping/payment methods name or image easily without any change in the code. Make any field optional: There is an option in this responsive one-page checkout addon using which admin can make any field optional or mandatory. Sort address fields: The Prestashop store admin can also manage to sort all address fields using drag and drop feature. Example: Phone number field can be placed just before First name etc. 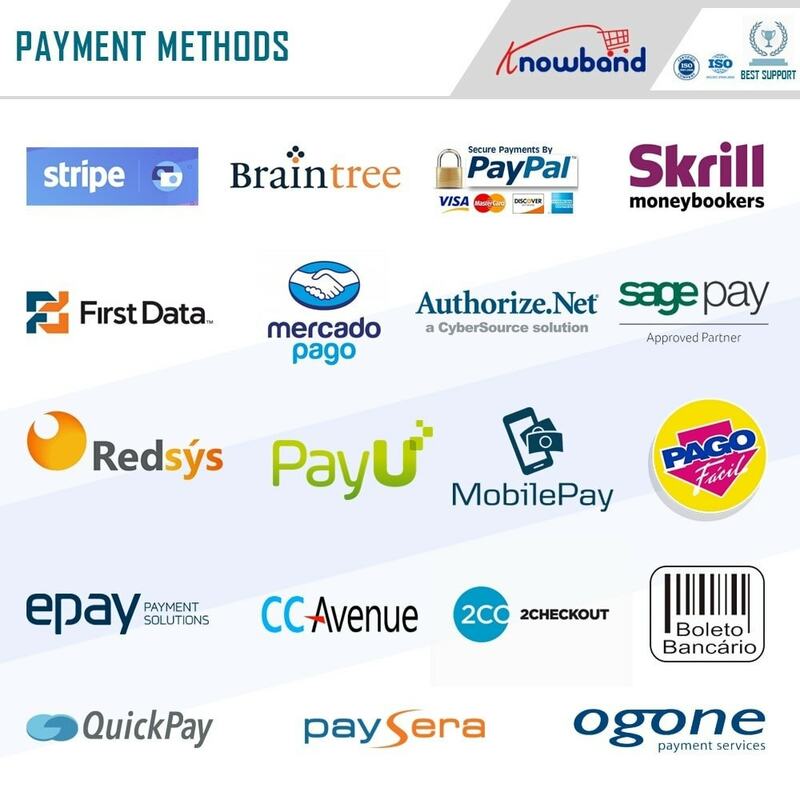 Ship2pay: Using this feature the store admin can disable payment methods based on customer shipping method selection. Custom CSS and JS: There is an option in admin panel to add custom CSS and JS. Admin can use this feature to make desired changes without editing core files of one step checkout addon. Custom HTML: This simplified checkout addon also has an option to add multiple custom HTML block at any place. Admin can promote any product, display any promotion OR provide any messages to our customers regarding deal, shipping or payment method information etc. 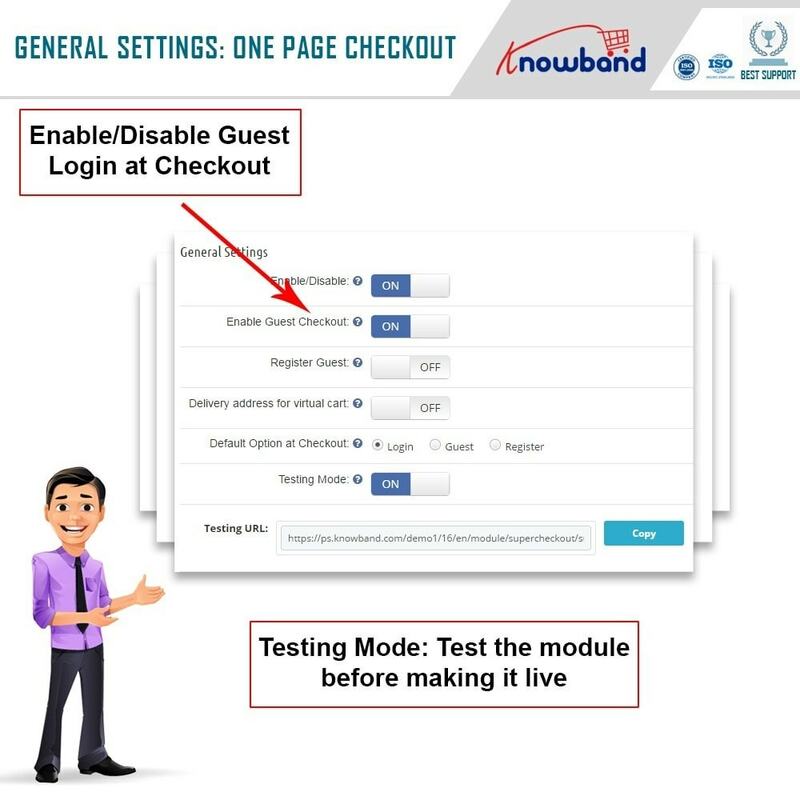 Testing mode: The one-page checkout addon has a testing mode using which admins can test the module on their live site without affecting their ongoing business. If the testing mode is enabled, all customers will go to default checkout of Prestashop and admin can test the module page using a URL which will be shown in one step checkout module's admin side. FAQ tab: We understand the value of your time and therefore we have added all basic queries related to this quick checkout module in our admin panel so that you don't need to contact us for small issues/queries. Custom Fields: System Admin can add any number of custom fields on the checkout page. Google and Facebook Login: This Prestashop One page checkout/One step checkout module allows your customers to signup or login to their Google or Facebook account. Inline Validation with error message: Our one-step checkout page also has inline validation and shows proper error message along with tick and cross sign so that customers can quickly identify their mistakes while filling the form. Mailchimp Integration: This Mailchimp integration feature allows admin to automatically send customers email id to desired Mailchimp list. Ajax Based update: Our one-page checkout plugin uses ajax based updates so no more irritating page reloads on the checkout page. Add Gift Message: Allow your customers to add a gift message along with their order. This message is visible to the admin on the order view page at the backend. Geotargeting: By enabling this feature, the country is auto selected and filled in the address field based on customer IP. Google Address Autofill: Using Google Places Integration API key, admin can enable the auto-fillaction for address fields. 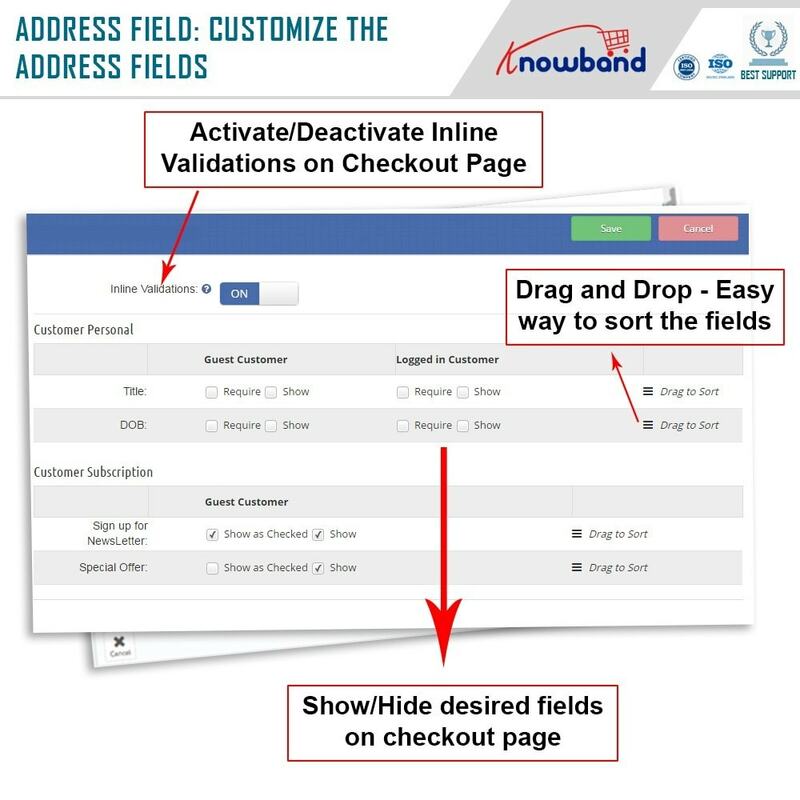 As the customer starts entering into the provided address field, it automatically shows some recommendations to choose from. Free Products: This quick checkout addon is compatible with free products. In case of free products, it doesn't show payment methods. 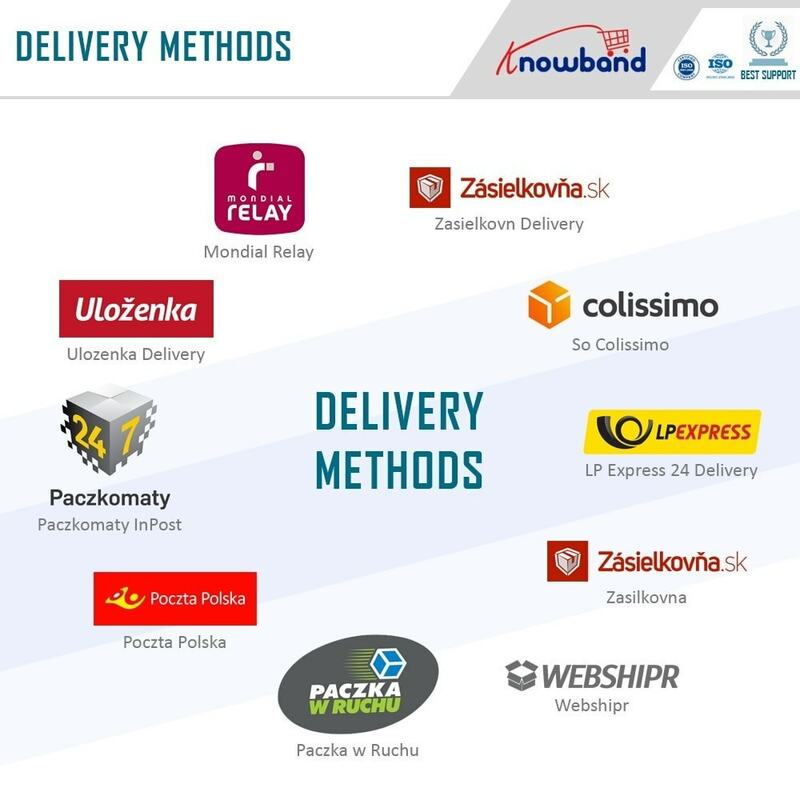 Virtual/Digital Products: The fast checkout module is compatible with virtual/digital products, in case of virtual products it doesn't show shipping methods and can also hide delivery address form automatically to show only invoice address form. You can also configure it to ask customers only email id, first name, and last name. 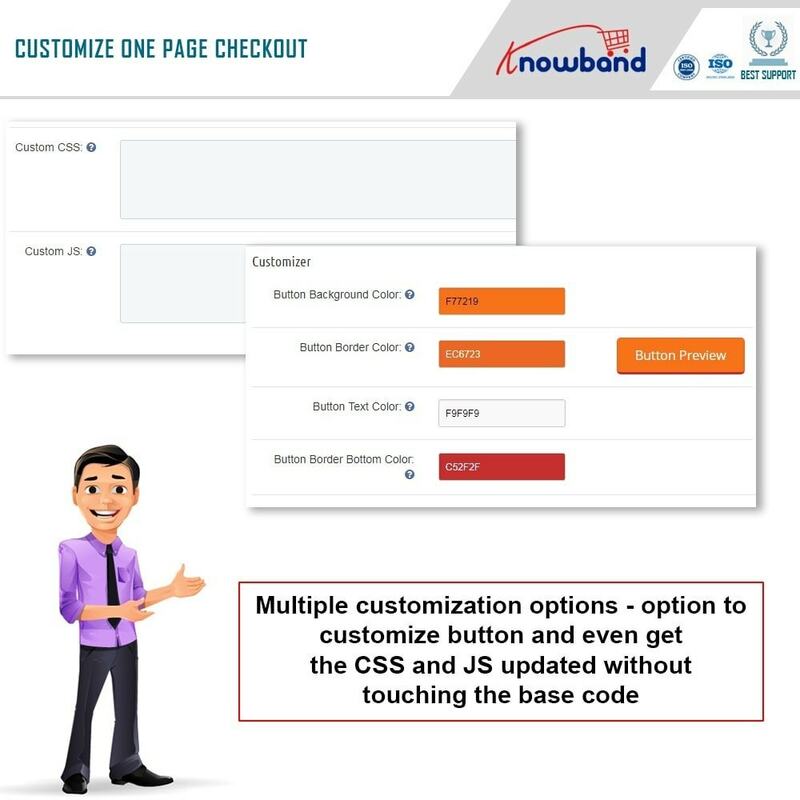 Customizable products: The responsive checkout module is also compatible with customizable products and shows complete cart information with all customization details along with an option to change added product quantity or to remove it completely from the cart. Multiple Shipping methods: Our single page checkout add-on works fine even if there are products in the cart which require multiple shipping methods. Automatic Customer Registration: Our responsive checkout module has an option to register guest customers automatically. If enabled, it generates a random password for the guest customer and sends it to the customer via email. If your Payment Method works with default checkout of Prestashop but not with Super Checkout, we will fix the same for FREE within a valid support period. 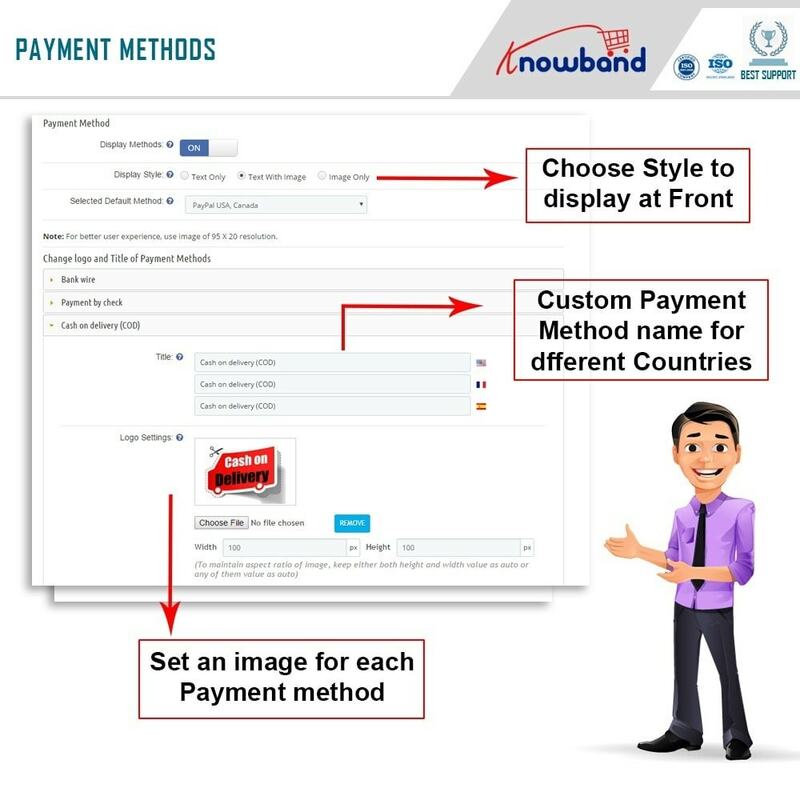 Default shipping and payment method: Set which shipping and payment method should be selected by default for customers. Reduce Abandoned cart: Study shows that more than 60% abandoned cart is because of the complex or slow checkout page since our single page checkout module makes checkout process easy and fast, hence reduces abandoned cart rate. 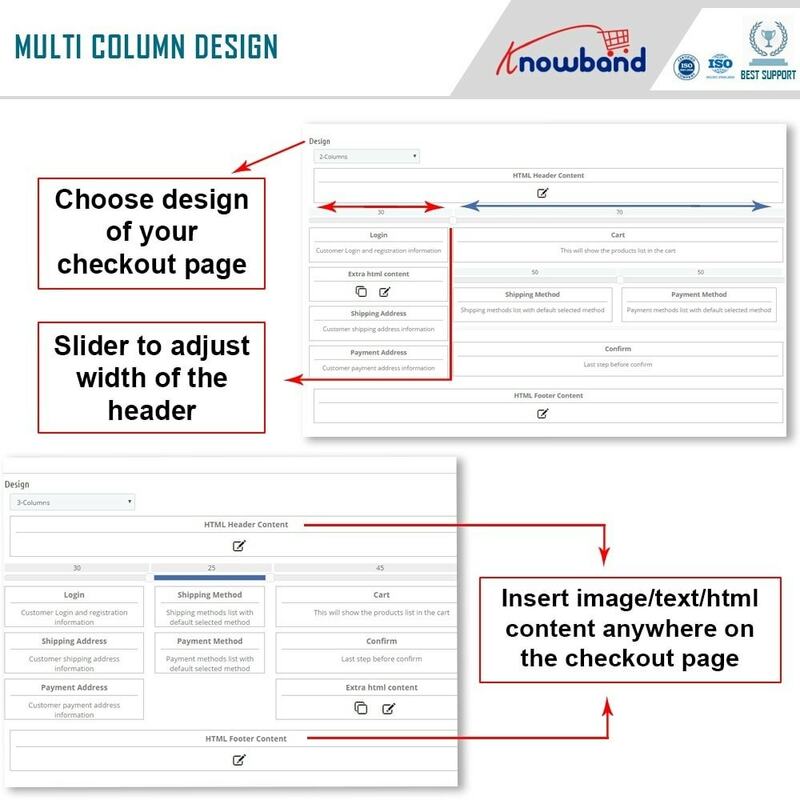 Multiple Layouts: Choose how many columns you want to show to your customers and also define the column size. Define which section appears where. Choose from 1 Column, 2 Column, and 3 Column layout options. Admin can chance the address fields layout from 1-column to 2-columns i.e. First name & last name can be shown in a single row. Similarly, Country & state can be shown in a single row. SEO and SSL: This fast checkout module is compatible with SEO URL structure and can also be used if SSL is enabled on the website. Newsletter and voucher field: Option to show or hide newsletter and voucher field on the checkout page. Complete Cart summary: Full cart summary, show product image directly or when a customer "move the cursor over product name". Fully Responsive: This quick checkout module is fully responsive and compatible with all devices and browsers. Show or hide total tax field in the cart summary section of one page checkout.one page checkout.one page checkout.one page checkout. 4. You may also like our Abandoned cart module, this addon reduces Abandoned carts on the store and increases conversions.